Can I just say wow? I never expected ReVamped to be such a mind-blowing book! It has been ages since I read a book with such a fresh idea as ReVamped. Yes, it's about vampires, but I enjoyed every single page of it. The story is about, Dawn, the main protagonist, who is the daughter of the Vampire president. Yes, in this book, vampires are known throughout the world. Some even work in hollywood and join competitions like "Vamp Idol". It gives off such a new refreshing angle about vampires. I'm starting to love reading about them again after I read ReVamped and The Immortal Rules by Julie Kagawa. Dawn has been training all her life in her father's headquarters. She grew up to be one of the most highly trained vampires. Her wish was to go on a mission, and finally, it came true. Her father sends her to "Angel Creek"on a mission to train some vampires who will have the responsibility of protecting the people of Angel Creek. Turns out the task is harder than Dawn ever imagined. She meets Ethan there, a human who became mesmerized by her beauty. Not only that, she also meets another guy! *yay* Someone tells her about this vampire in Angel Creek, and Dawn just had to know more about him. Sebastian, is a very talented vampire, and I loved his character very much. Both of the male protagonists were not your typical "bad boy" characters that you see in so many books nowadays. Even though the romance can be considered as "not much", it was very cute and simple. What I most enjoyed about "ReVamped" is that I never knew what to expect from this book. Every chapter shocked me more & more. I especially loved the cosy friendship between the vampires. Every time I opened the book, I felt like I was on an adventure with Dawn and the trainee vampires. I recommend this book for all readers out there, and if you feel sick of vampire books, you have to give this one a shot! I thank Ada Adams for writing such a lovely story. Awesome review!! This book sounds really good! *raises hand* I am one of those who are sick of vampire books. I wish I could say there's an easier way to KNOW which vamp book isn't blah and which is WOW. I have to say though, very curious about this one, and your rating is very encouraging! 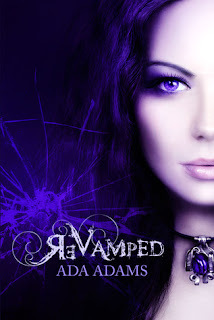 "ReVamped" is different than a lot of books in the vampire genre because the main character is a strong girl, so that made it much more enjoyable to read. I don't really like weak characters (I like books like "The Hunger Games" instead of "Twilight"). Dawn has just enough strength, but also weakness to make her enjoyable. Other characters are also interesting and everyone has a good backstory. I like how they all grow and develop over time. Sophie was such a sweetie and Hunter and Seth were funny. Ethan and Sebastian sounded so hot! Where can I meet these guys? The scene at the end was my favorite (I won't share the spoiler for this one either), but I wanted it to keep going forever. I hope there's a sequel coming out soon because I want more Dawn and Sebastian.